Lydford House is currently not offering evening meals, we may offer guests to eat here if we are opening the restaurant for existing dinner bookings. There are two restaurants in Lydford, both within a short walking distance of Lydford House, we are happy to make a booking for you or provide more information. Its advisable to book in advance on summer or weekend nights or if you are traveling in a large group. A wide variety of foods are available at breakfast times, guests have the choice of a continental buffet and a cooked menu. Vegan, Vegetarian, Gluten and Dairy Free options are available. Treat yourself to a Large Homemade Scone, Strawberry Jam & a generous dollop of Rodda’s Clotted Cream. £6.50 per person, served all day every day. Selection of finger sandwiches, our Homemade Scones and a delightful selection of Cakes. 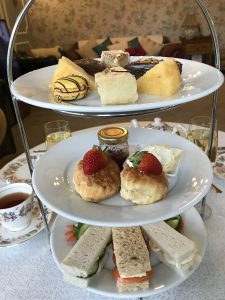 We require 24 hours notice for Afternoon Tea bookings as it is made fresh to order. Copyright © Lydford House - All Rights Reserved.